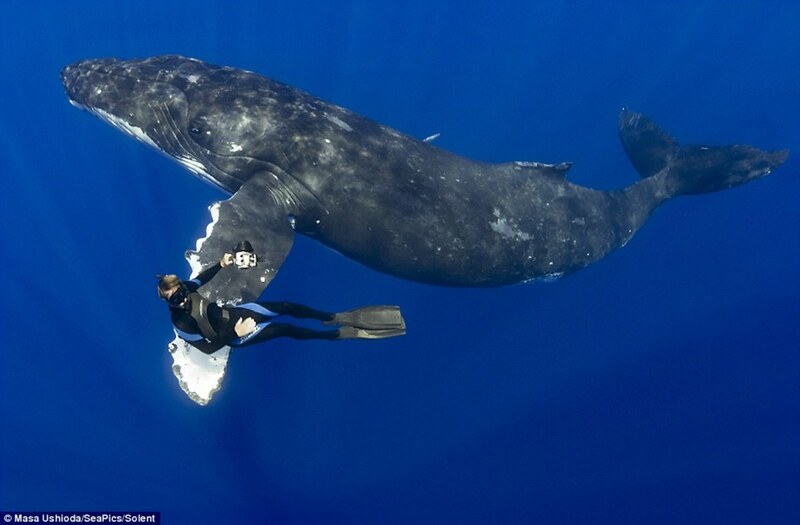 A diver “shaking hands” with a 52-foot whale had it all captured by a diving friend off the coast of Hawaii. The divers were swimming about 50 feet underwater near a group of humpbacks when one that weighed an estimated 79,366 pounds offered a flipper, according to the U.K. Daily Mail. Photographer Masa Ushioda, of Tokyo, had moved to Hona, Hawaii, and he took the pictures of the underwater meeting near his new home. The friendly whale can be seen elegantly swimming on her back as she shows off her dancing moves while gliding through the water. It was apparently a bid to tell amorous males nearby to back off.